The U.S. economy grew even slower than initially reported in the second quarter, as both consumers and businesses spent less than originally thought, and the drought in the Midwest limited agricultural production. Gross domestic product, the broadest measure of the nation's economic health, grew at an annual rate of 1.3% from April to June, the Commerce Department said Thursday, slower than the 1.7% rate the government last reported in August. The downward revision came as a surprise to economists who were largely expecting the figure to remain unchanged. 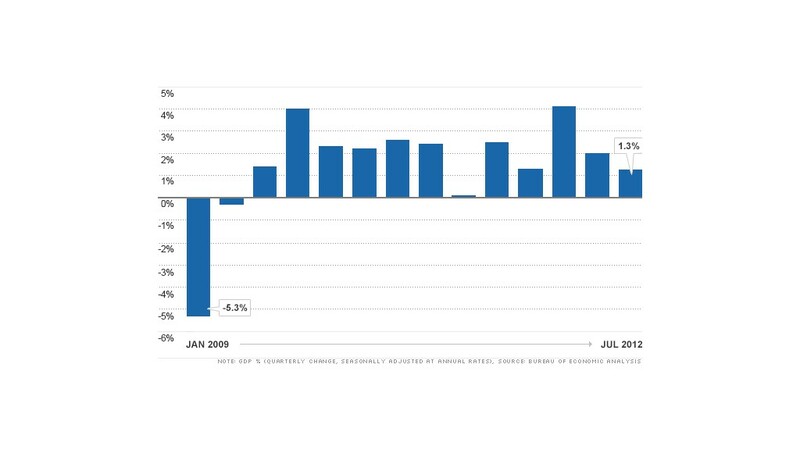 It also marked slower growth than in the first three months of the year, when GDP accelerated at a 2% annual rate. "The 1.3% increase in GDP was the weakest since the third quarter of last year and one of the weakest seen since the recovery began three years ago," said Chris Williamson, chief economist for Markit. "The weakening was evident across businesses and consumers." The government typically revises its GDP reports twice, and Thursday's data marks the final revision to the second quarter figures. The changes make little difference to the overall economic picture of the country. Growth is still frustratingly slow, and economists often say the economy needs to expand at least 3% a year to bring the unemployment rate down significantly. The revisions were due to slower consumer spending on goods and services, as well as less investment in business structures, equipment and software. Trade also contributed less to GDP than last reported, as exports were weaker than originally thought. Meanwhile, farm production took a hit in the spring, due to the drought in the Midwest. Farm inventories dropped by $7.9 billion in the second quarter. Economists surveyed by CNNMoney ahead of Thursday's report were forecasting that growth will pick up in the third quarter, but not by much. They're predicting GDP grew at an annual rate of 1.9% from July to September. That's still not enough to boost hiring significantly.